If you search your ancestors in Montecalvo Irpino, Campania, info about your Italian family are stored in the City Office archives or at the parishes. In towns and villages of Campania and in Avellino province registry offices were established in early 1800: it means that you could find information in Montecalvo Irpino registrar as of that date. So, if your ancestors were in Montecalvo Irpino in the nineteenth or twentieth century, then you could try to contact the City Office of Montecalvo Irpino to know more. 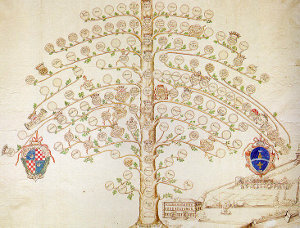 Before to start your genealogy research in Montecalvo Irpino, we suggest you to read our tips for your search . They are useful to search in Campania and in Montecalvo Irpino too. 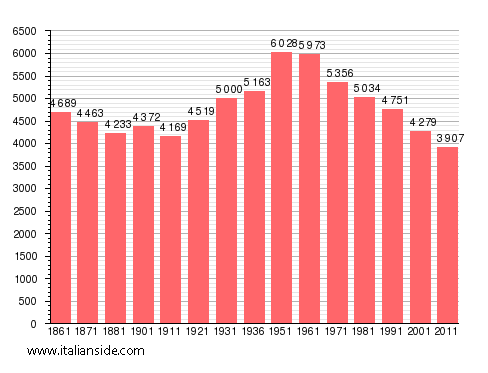 Next picture shows the demographic trends in Montecalvo Irpino from the Italian Unification (1861) an important info to understand how many people lived there in the past. It could be important to know if the last name you are investigating is a frequent surname in Montecalvo Irpino. As more your surname is common in Montecalvo Irpino, as more it could be difficult to find the right info about your ancestors in Montecalvo Irpino archives if you have not exact dates. If you have the opportunity to visit Montecalvo Irpino and Avellino province, you could plan to investigate churches’ archives by yourself, but from abroad is very difficult to obtain any result unless you find a reliable local help. If your research is in a dead end and you need professional help from our local Italian genealogists write to montecalvoirpino@italianside.com our expert in Montecalvo Irpino area will study your request and will reply to you with a research plan and a quote. Great grandfather was Luigi Lorenzo Stefano Mangialetto His wife was Filamena Maria loCasale Mangialetto from Montecalvo Irpino. 1860? came to US through Queen’s Island New York. His father was Fedele Mangialetto mother was Agnes Sorentino. My great grandfather Pietro Mangialetto and his son, my grandfather Leonardo Mangialetto came to the US from Montecalvo Irpino thru Ellis Island in 1906 at the ages of 48 and 14. My grandmother is Rose (Albano) Mangialetto. I don’t know when she arrived in the US. My email is dmangia@mac.com if anyone has further info. Thanks. I had Grandfather Sam De Blasio born 1882 came 1910 and Grandmother Filomeno Migaudio from Montecalvo irpino avellino italy looking for any relatives? My maternal grandmother was Carminella Dagostino (or spelled D’Agostino)from Montecalvo, born approximately 1886. Her brother was Leonardo, sister Lucia. She married Francesco Pappano and emigrated to the U.S. There are still relatives in Montecalvo I think (17 Dagostinos), but I don’t have contact with them. I’d be curious to know more about her family tree. My grandfather, Frank Dagostino, immigrated to the US around 1910. He was born in Montecalvo Oct 12, 1890. We recently visited Monntecalvo but had no luck determining who his father was. We found the D’Agostino vault-crypt in the Montecalvo cemetery and the oldest person there was Felice Fu Carlo D’Agostino, born 1886. We believe all or most of Frank’s brothers also immigrated, so we have no idea what the relationship is between Frank and Felice. Perhaps brothers or cousins as they were born 4 years apart. My uncle’s name was Carlo Dagostino so there is probably a connection. if you have any information about these relationships,I would be most grateful. PS Frank married Catherine Cataldo in the US. Catherine was supposedly born in Potenza. My maternal grandmother was Carminella Dagostino, born in 1886. She had a brother, Leonardo, and a sister Lucia, perhaps others… She married Francesco Pappano (not sure if he was local) and emigrated to the US (I’d have to look up the date). They lived in Chester, PA. My parents and I visited Montecalvo in 1965, up in the hills, out on the farms. I don’t have contact with relatives still there; I think my cousin in her late 80’s does. Sorry it took so long to get back to you. I lost this web page and just refound it. Frank, born Francesco, had several brothers according to my father. They all came to the US at the same time. Some of them continued off to Argentina (?) and Frank and at least one other stayed in the US. Frank moved to Worcester MA. The others went to NJ I think. I’ve not been able to trace Frank’s family at all. I did make it to Montecalvo and found many D’Agostino grave sites but it was a national holiday and even the grave yard was closed. Have you found anything since? Once of my cousins said she was told Frank was born in Avellino, the local capitol of Avellino and the county where Montecalvo is located. My grandfather and his family lived in Montecalvo Irpino. I have found 12 people with the same last name and so far have written to 5 of them. Should I get a response and find out that they are indeed a relative, how difficult would it be to travel from Rome to Montecalvo? I will be in Rome the first week of May. My great grandparents, Josephine & Louis Tarone, came to the United States in the early 1900’s, from Montecalvo, Italy, according to my father. I am trying to find out if they were really from Montecalvo, and if I still have any relatives living there today. Perhaps the surname was changed upon their arrival in America. I am looking for some answers, so that perhaps I can visit Montecalvo one of these days. If you would like to start a research in Montecalvo Irpino please send your request to montecalvoirpino@italianside.com.